Throughout 2018, GreenEarth has seen its most successful year to date, when it comes to building relationships with garment retailers and manufacturers. There have been more labels with with our logo than ever before, but we are now starting to see our branding and messaging appear on instore leaflets, hang tags, websites and packaging. And not only is GreenEarth being adopted by more brands, they are positioning OUR logo on more product within their ranges. The key to achieving this is continued engagement with Retailer and Manufacturers. So far this year, there have been 21 Technical Visits to Johnson Cleaners Specialist Centre in Rugby, U.K. In addition, we have hosted a Technical visit at Jeeves of Belgravia in London, 3 webinars and held our own event in London. 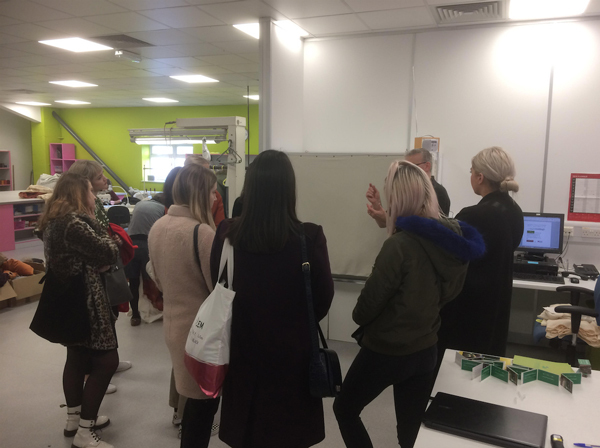 There have been 130 delegates on the Technical Visits to Rugby, across 25 companies – These include high end retailers through to online fast fashion. There have been 10 approved care labels in 2018 so far, 7 of which are from brand new recommending retailers. The same label is often used in many products for the same brand, just changing the style code. So, the consumer is becoming more aware of our brand. This is something GreenEarth aims to build on in 2019 because GreenEarth IS what all the best labels are wearing! If you are a manufacturer or retailer and would like to find out more about our events, please visit our Events Page.